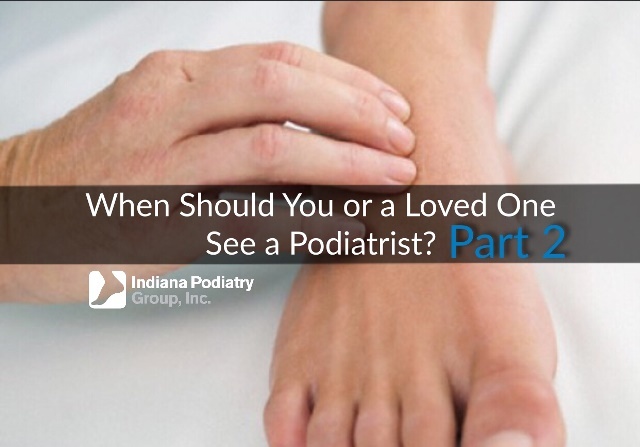 When should you or a loved one see a Podiatrist? • They have diabetes. If you have a loved one who has been diagnosed with diabetes, contact us to set up the earliest possible appointment. Whereas other medical issues associated with the disease receive more attention—like heart attacks, strokes, kidney failures, and blindness—foot care is incredibly important for diabetic individuals. Indiana Podiatry Group is here for all of your foot and ankle needs, but you have to take the first step. The good news is that it’s not a painful one! Simply give us a call. You can reach us (317) 773-7787 and our staff will be glad to help!